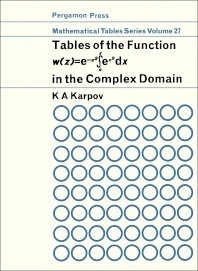 Tables of the Function w(z) = e-z2 z?0ex2dx in the Complex Domain contains tables of the function in connection with the problem of the radio wave propagation. These tables are compiled in the Experimental-Computing Laboratories of the Institute of Exact Mechanics and Computational Methods of the U.S.S.R. Academy of Sciences. The function w(z) is represented in the upper half-plane by the asymptotic series. Description of the tables and method of computation is provided. This book will prove useful to mathematicians and researchers.